Every year, 3 to 4 million healthy, adoptable pets are euthanized at our nation’s shelters. American Humane and the entire animal welfare community are forced to question: What needs to be done for these animals to be adopted? And what can be done to ensure that those who are adopted stay with their new families? 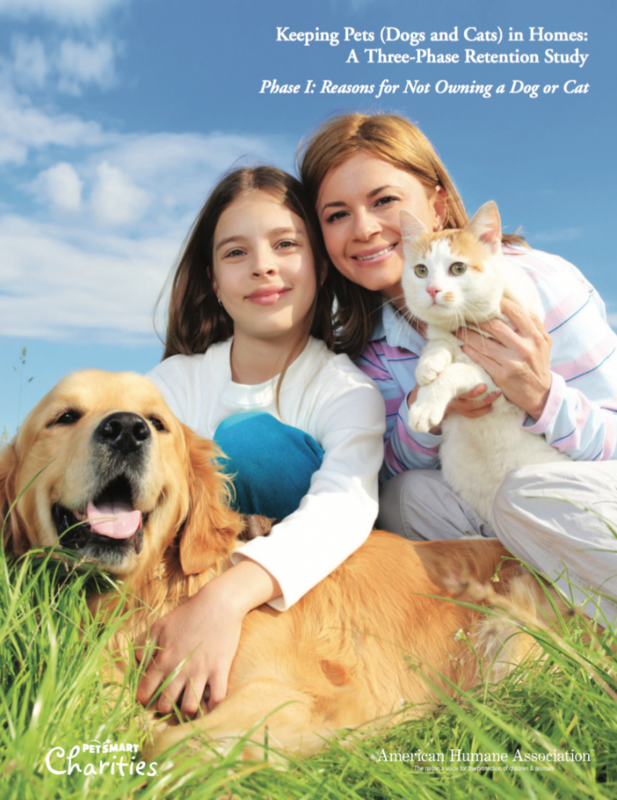 American Humane’s Animal Welfare Research Institute embarked on a multi-phase study in 2012 to better understand what is preventing people from adopting these animals and, more importantly, to learn the most effective strategies to ensure that newly adopted pets stay with their families, preventing relinquishment to shelters. By learning more about the barriers to pet ownership and lifelong retention, we can take measured steps to change minds, change policies, and change activities to help get more of these beautiful animals out of shelters and off the streets into the arms of loving families. With generous support from PetSmart Charities, Inc., American Humane’s Animal Welfare Research Institute has completed the first phase of this effort, which focuses on better understanding why more than half of U.S. households do not currently own a dog or a cat. According to the American Pet Products Association’s National Pet Owners Survey (2011-2012), 38.9 million U.S. households own a cat and 46.3 million U.S. households own a dog. With the total number of U.S. households estimated at 117.5 million, there are many homes without pets. Understanding the reasons for pet ownership and relinquishment is crucial for developing strategies to reduce the number of homeless pets and euthanasia rates in our nation. For more than 135 years, American Humane has succeeded in protecting America’s children, pets, farm animals, and animal actors from cruelty, abuse, and neglect. Everything the organization does is rooted in science so that our actions, policies, and outreach may do the most good. In this ever-changing world, new threats to our most vulnerable constantly emerge, reinforcing the need for constant evaluation to protect our most precious treasures. Through projects such as this, American Humane and our Animal Welfare Research Institute hope to advance our knowledge of the challenges facing the wellness, welfare and well-being of the creatures around us and to strengthen the remarkable physical and emotional bond between human beings and the animals that share and enrich our world.